For the first time, using satellites, researches trace the migration path of green sea turtles – a seriously endangered species - in the Mediterranean. Every summer inspectors from the Parks and Nature Authority return to the sea small turtles that hatched from eggs collected along the beaches and kept in guarded sites. They know that the turtles face a life of wandering filled with danger. Now thanks to a study done over the last few years, for the first time we can trace the path of these creatures, who spend a long period of time on the shores of Egypt and Libya, among other places. Last week, the journal Diversity and Distributions published the findings of a satellite tracking system following green sea turtles in the Mediterranean. This is a seriously endangered species. The monitoring was led by researchers from Exeter University in Britain. They were assisted by scientists and environmental organizations from countries throughout the region, including Lebanon, Syria and Israel. The researchers attached transmitters to the bodies of 35 females when they came ashore to lay their eggs in the sand. The baby turtles that hatch from these eggs make their way back to the sea independently. Most of the turtles in the study were from Cyprus but there were also three that came from Israel’s Mediterranean coast. The tracking was done from 1998-2010. The researchers also collected information on the condition of the turtles in the various regions. The satellite tracking shows that green sea turtles migrate to 10 main areas used as feeding grounds. Some swim as far as 200 kilometers from the hatching areas to reach them. There were some that swam as far as 2,600 kilometers. 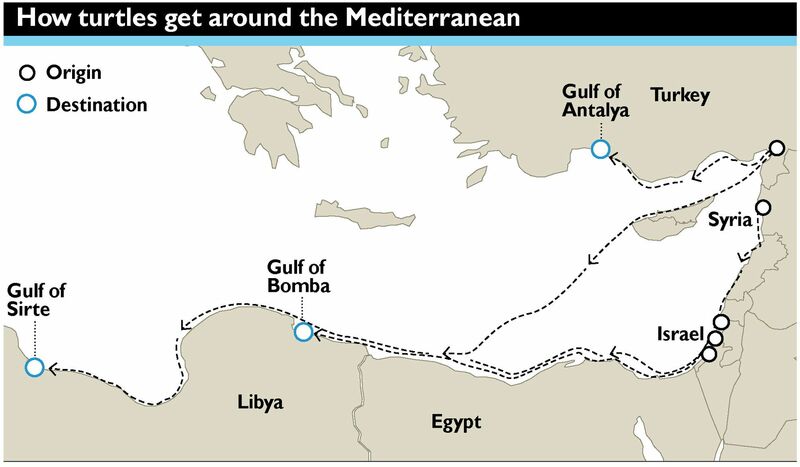 The two main sites to which more than half the turtles came were the Gulf of Bomba and the Gulf of Sirte in Libya. Fourteen percent of the turtles came to the Gulf of Antalya in Turkey. Many migrated along the coasts in a corridor stretching from Turkey, Syria and Israel to Egypt and Libya. Another migration corridor connected Turkey with Cyprus, and from there to North Africa. The greatest density of female turtles that were tracked was in the corridor located between the waters of Cyprus, Egypt and Libya. The researchers found that the green turtles are in great danger along their migration corridors. Fishing boats operate in these areas and many turtles are caught in nets. Only some are returned to the sea and the rest – an estimated 20,000 turtles a year -- die. In some countries, including Israel, there has been a big decline in the past decades in the number of green turtles coming to lay eggs. This was the impetus for collecting the eggs and keeping them in protected farms to increase the chance that the turtles that hatch from them will be able to safely return to the sea. In Israel, the Parks and Nature Authority also operates a center for rescuing sea turtles that treats injured turtles. Some of them are returned to the sea after medical treatment, including some that are missing limbs. The authors of the study recommend making the Gulf of Sirte in Libya a protected site for the turtles that come there. But given the political instability in Libya, this recommendation will be very hard to implement. Another recommendation is to continue and expand the turtle tracking. This could help to identify the locations where the turtles are hurt, in an effort to reduce this problem. The scientists suggest, for instance, that more educational efforts among fishermen could increase the odds of fishermen being careful to release back into the sea all the turtles that are mistakenly caught in their nets.